So, according to the calendar, today’s Valentine’s day! 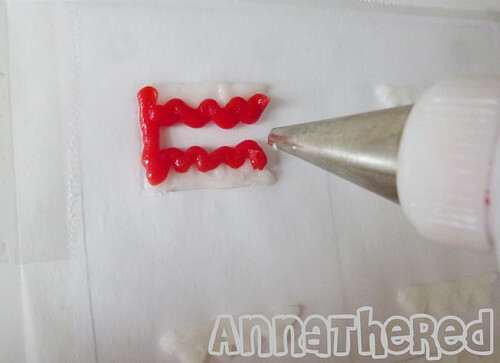 I thought re-posting old how-to’s and bento for Valentine’s day isn’t very exciting, so I decided to make something! 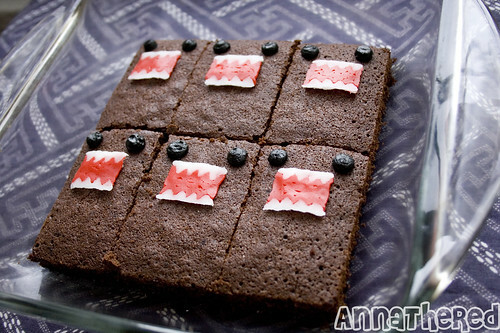 I know I’ve already made Domo-kun themed sweets, but this one seemed just so easy I had to try it. 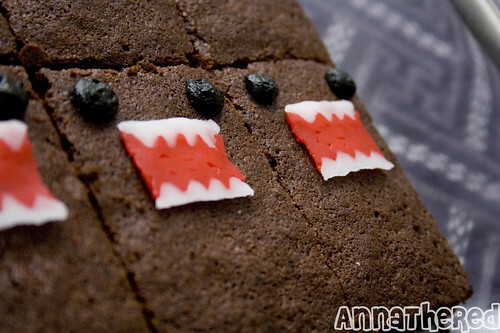 First, I made brownies for the body of Domo-kun. You can, of course, use any brownie recipe for this. I used the “Mmm-Mmm Better Brownies” recipe on Allrecipes.com. I made a little change to the recipe though. I used melted butter instead of vegetable oil, reduced the sugar from 1 cup to 3/4 cup, and used an 8X8 glass pan instead of 9X9. My baking time was about 28 minutes because I used the smaller pan. While I was baking the brownies, I started making the mouths. When I made the mouths for chocolate covered marshmallow Domo-kun, I made the red icing first, put them on each marshmallow, and added teeth to it. 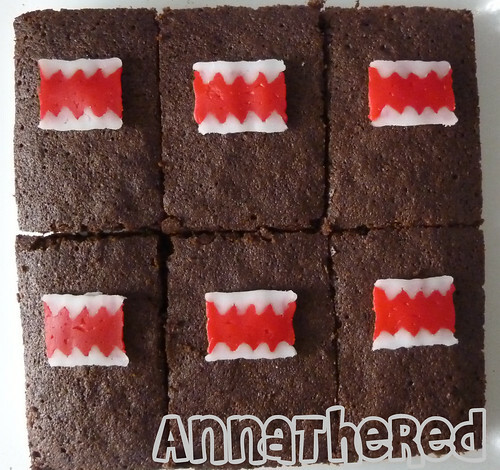 But for these brownies, I wanted to put the teeth & inside of the mouth (red part) on a brownie at the same time so I tried another method. 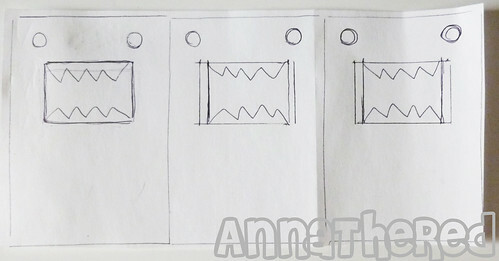 To keep all mouths the same size, I drew rectangles as big as each brownie on a piece of paper and drew faces on them. 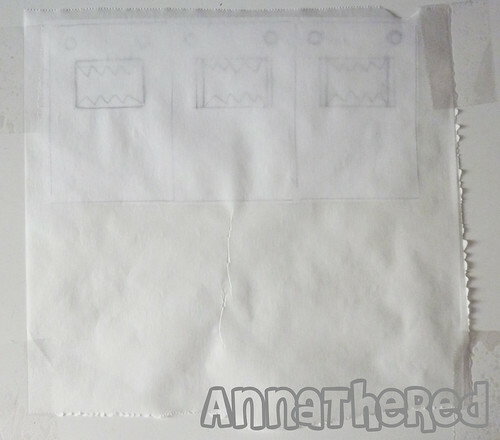 I put parchment paper over the drawing with scotch tape, and traced the outline with white icing. Make sure you use tape so the parchment paper won't move. 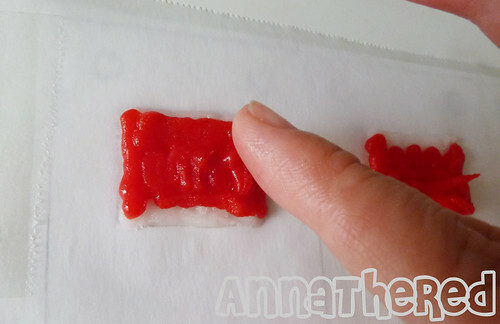 Then I spread the icing with a toothpick, and gently flattened the surface with a wet finger. TIP: Always make extra pieces! Better safe than sorry. I carefully put the whole thing into the fridge for 15 minutes. TIP: I recommend Wilton’s icing. 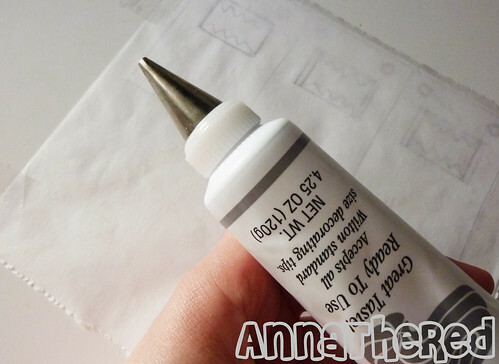 They sell decorating tips for Wilton’s icing tubes which you can attach directly to a tube in a supermarket. They are usually right next to the icing tubes and very convenient. 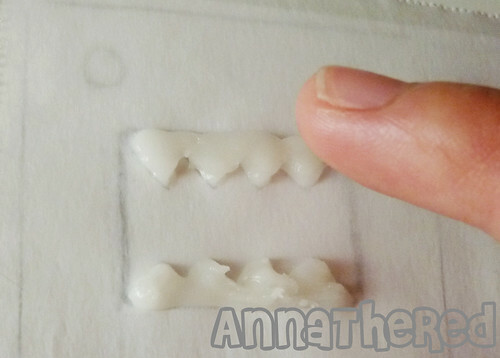 Once the teeth had hardened, I squeezed red icing around the zig-zag part of the teeth, filled the space between the teeth, and then drew a line on the both side of the mouth. Then I gently flattened the surface with a wet finger and I carefully put the whole thing into the fridge for 15 minutes. Make sure not to touch the white icing. 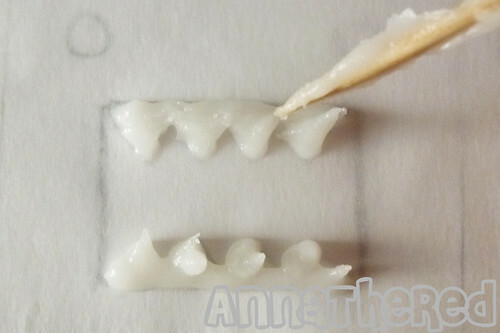 Flatten it very gently. You don't want to mess up the white icing. When the brownies were completely cooled down, I moved the mouth icing into the freezer and let it sit for about 15 minutes. 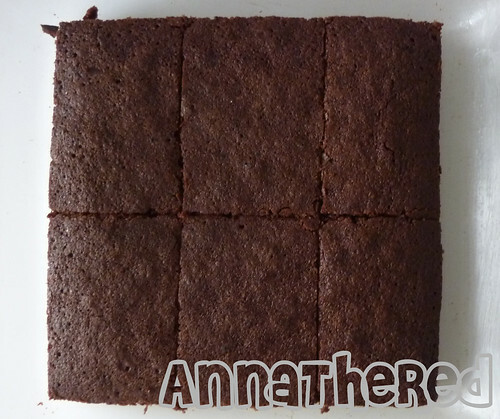 Make sure that brownies are completely cooled down, and edges trimmed and cut into 6 pieces. If they're hot, the icing will melt as soon as you put it on it! 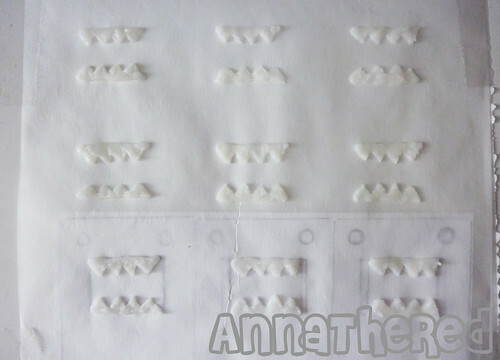 I took the mouths out of the freezer, flipped the paper onto another piece of parchment paper, and used a toothpick to SLOWLY peel each mouth part. 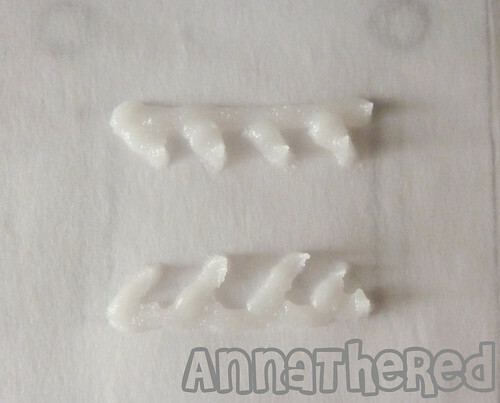 (If the icing is still stuck to the paper, put it back into the freezer for 5 more minutes.) 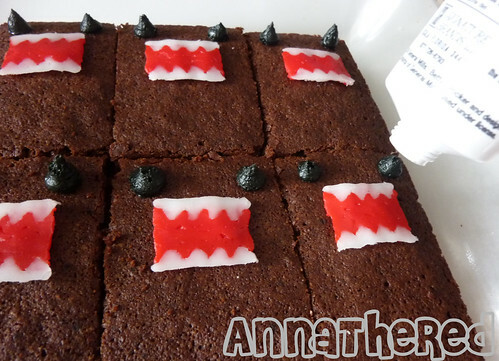 As an adhesive, I squeezed a bit of icing (any color would do) where each mouth would be and put a mouth on each brownie. TIP: Icing may melt and crumble if you touch it with your hands, so use a fork to scoop each mouth to put it on the brownie. For the eyes I squeezed black icing (or melted dark chocolate if you don’t have black icing). I couldn't find black icing by Wilton, so I bought one by Betty Crocker. 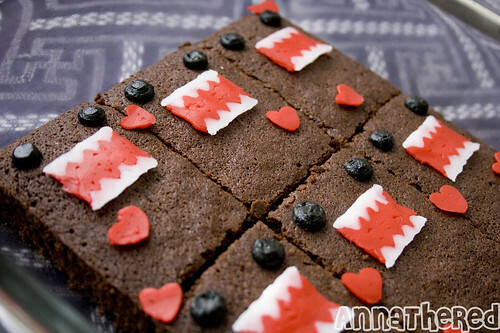 The eyes are pretty big so I didn't even put the icing in a decorating bag and squeezed it directly onto brownies. After I put all the eyes, I flattened the surface of the eyes with a wet finger, and there they were! 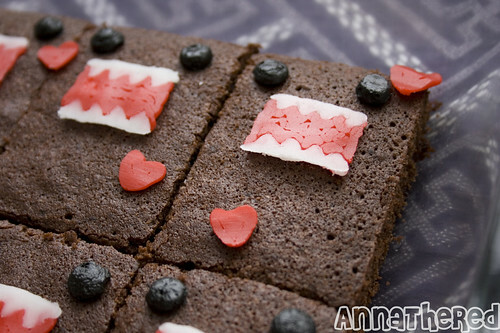 I also made bunch of heart-shapes with red icing, and I sprinkled them around to make it more Valentine’s day-ish. The icing hearts were made just like the mouth. Squeezed onto parchment paper and hardened in the fridge. You can probably use mini-chocolate chips for the eyes. Aww this one looks like a girl! I spent about 1 ~ 1 1/2 hour for this one (it took a while for the brownies to cool down), and it was super easy! 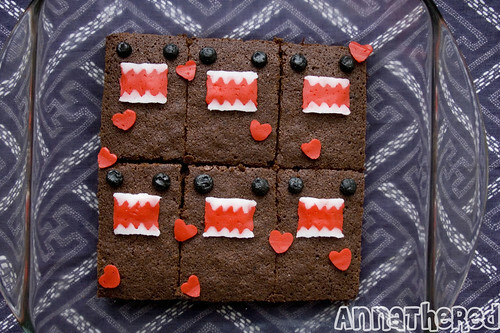 Derek isn’t a huge fans of icing, but he enjoyed gobbling down these Domo-kun brownies! 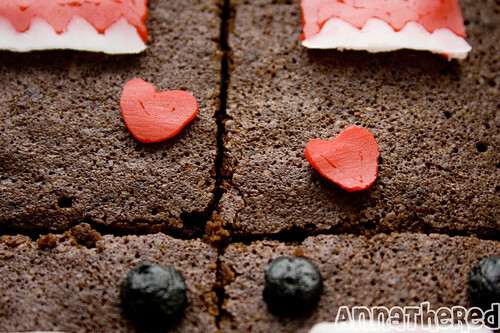 Valentine’s day has already started (at least in East coast), hmmm, maybe I can make something else… Don’t tell Derek! So cute! 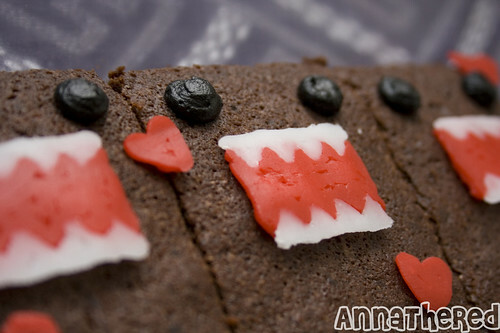 I will definitely make this soon. Surely I am not the only person to see the swastikas on that fabric. I know you are from Japan, but come on. I used a different brand of icing, and unfortunately, after what accumulated to an hour in the freezer, they wouldn’t harden enough for me to remove them from the parchment paper! At least I had brownies.